E. E. "Mel" Kovachek, Lieutenant Commander, born Dec. 19, 1920, Milwaukee, WI. Attended two years and joined the USN (Air) July 24, 1942. Stationed at Pensacola, Alameda, Seattle, USN Academy, USS West Virginia. Memorable experiences: patrolling Alameda, CA; instructing at Pensacola and USNA and Reserve flying in California. 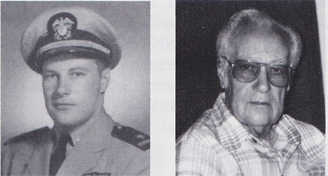 LCDR Kovachek was discharged Oct. 1, 1956. Lieutenant (jg) Emil E. Kovachek, former aviator on this vessel, whose mother lives at 2148 South 18th Street, Milwaukee, Wisconsin, was awarded the Distinguished Flying Cross, "For distinguishing himself by meritorious achievement while participating in aerial flight as pilot of an observation spotting plane during the assault and occupation of the Philippine Islands, Iwo Jima, and Okinawa."